JoeJoomla started at Joomla! version 1.0. There was a huge community of Joomla! users that formed around this initial version. Many were from an open source project called Mambo which forked to become Joomla. JoeJoomla learned about Mambo after joining Joomla! 1.0. Currently Joomla! is at version 3.1.5. Along the way there were big changes to Joomla. 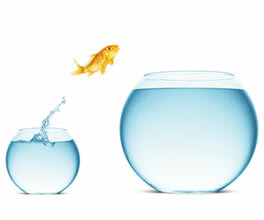 Upgrading from v1.0 to v1.5 was not a simple upgrade but a larger effort called a migration. This was because Joomla! changed its structural underpinnings significantly. The same thing happened moving from 1.5 to 2.0. Another migration was required. A lot of Joomlers are still hanging back in version 1.5 at this point. JoeJoomla.com was created with Joomla! v1.0. We migrated to 1.5 soon after it was available. When version 2 of Joomla! was released we waited until version 2.5 to move forward again. We will go to v3.x soon. Fortunately moving from version 2.5 to 3.x will be a lot easier. A one-click upgrade has been provided from Joomla! 2.5 to a Joomla! 3 version. You just have to make sure your template and extensions are compatible before upgrading. Joomla! 3 versions have the one-click upgrade system. Migrating complex Joomla! v1.5 domains to new major versions is not trivial. Careful planning, organization and testing are required to successfully move to the newest versions. If your Joomla! site is important to you and you are still running a Joomla! 1.5.x site you should be planning to make the required investment to migrate to Joomla! 2.5 or even 3.x with your domain sooner rather than later. This is because the server side requirements for a Joomla! 1.5 site to run are dependant on older versions of PHP. Joomla! 1.5 requires PHP 5.2 or 5.3, it will not run on PHP 5.4. Eventually web hosting services will update their servers to PHP 5.4 or newer and your Joomla! 1.5 site will no longer run. There is an excellent blog post on this by Alan Langford that you can read here. Alan's article points out that PHP 5.3's End-of-Life cycle started March 2013 and now there will only be critical updates. In regards to Joomla!, Long Term Support by the development community for versions 1.5 ended in September 2012. According to Google Trends, Joomla! 's popularity peaked around April 2009 at version 1.5.10 and has been trending downward ever since. This is despite the fact that the newer versions of Joomla! are much improved. Evangelism for any product or service is bolstered by its enthusiastic user base. Some of Joomla! 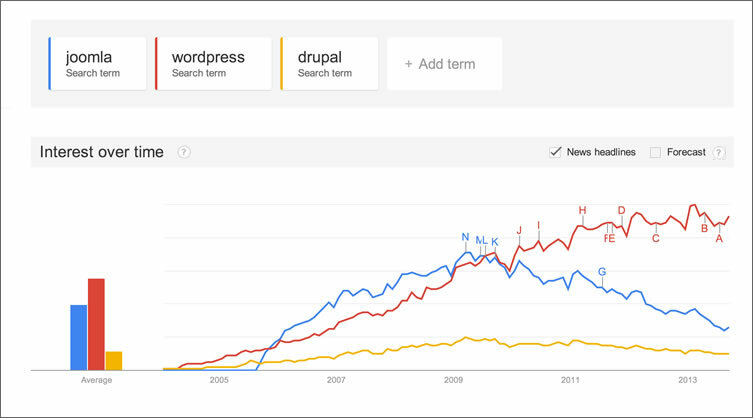 's loss of trending momentum may be due to the large group of Joomla! v1.5 website owners who have not moved forward. The loss of this large group of users evangelizing for the new versions is clearly being felt. The market share is made up of all the versions of Joomla. Version 1.x* is still the most widely used version of Joomla! at 58.6%, then version 2 at 37.6%, and version 3 at 3.7%. * Of the version 1 sites, 92.5% of them are Joomla! version 1.5.
created all the excitement and momentum for Joomla! The original adopters of Joomla! v1.x created tremendous excitement and momentum for the project. This needs to happen again. Reasons for holding back may be that that a site owner just doesn't need the new functionality of versions 2.5 or 3. The cost of moving forward may be too high for some. Others may just be waiting to get a better return on investment (ROI) on their initial investment in Joomla. Does it matter how quickly users adopt the new version? Imagine users of computer operating systems like Windows and Mac OS not adopting the new versions quickly. This has happened in the past. A very large percentage of Windows XP users refused to move forward for the longest time. They reasoned that the ROI was not worth the cost of moving forward. Windows still had a huge percentage of overall users, and they managed to get enough new users for the updated systems to keep development of those updated versions viable. Users of the Macintosh operating system were more willing to move to the next generation of hardware and software. Apple carried a good percentage of their previous user base forward while adding new users along the way. Updates to newer versions of the Mac operating system were significant but migration was easy and a lot of the more popular software used on Apple computers was ready and worked on the new version. Much of this is because of Apple's tight control over both the hardware and software. They were able to keep the hard work of migration hidden to the users for the most part. Joomla! is fantastic website building software but it's also important for it to be popular. If there isn't an attractive user base and less people are adopting newer versions of Joomla! the developers will go elsewhere. Some good news here is that there are people who care deeply about this and are working hard behind the scenes to ensure that a new crop of Joomla! 3.0 enthusiasts are found. There's very few systems on the World Wide Web that will give you everything that the current supported versions of Joomla! do for what it will cost to build your website. Joomla! isn't for everyone but if you need something with more capability than Joomla! you will also need a much bigger budget for your website. Google Trends doesn't tell the whole story but I'm on the side of those who want to create new momentum for Joomla. It's well worth it.